Chief Minister Pema Khandu today launched the Jeevan Pramaan sensitization programme in presence of the Chief Secretary, Principal Secretary and Secretaries and officers of Information Technology & Communications and Audit & Pensions. Pensioners post their retirement, have to provide life certificates to the authorised pension disbursing agencies like the bank, following which their pension got credited to their account. For obtaining a life certificate, a proof that he or she is alive, a pensioner earlier needed to be physically present before the Pension Disbursing Agency or had the life certificate issued by authority where they served and had it delivered to the disbursing agency. The procedure caused lot of hardship and unnecessary inconvenience particularly for the aged and infirm pensioners. Besides, a lot of government employees post their retirement choose to move to different location either to be with their family or other reasons, hence causing a huge logistical issue when it comes to accessing their rightful pension amount. Digital Life Certificate – External website that opens in a new window for Pensioners scheme known as Jeevan Pramaan seeks to ease this very problem by digitizing the whole process of securing the life certificate. With this initiative the pensioners requirement to physically present himself or herself in front of disbursing agency or the certification authority will become a thing of the past benefiting the pensioners in a huge way and cutting down on unnecessary logistical hurdles as it uses the Aadhaar platform for biometric authentication of the pensioner. The Chief Minister appreciated this Government of India initiative and termed it as a huge boon to the aged pensioners of the state government. Incidentally, the number of state government pensioners at present is about 26000 and only about 5000 still reside in Arunachal Pradesh. Pensioners avail their respective pension amounts either from the treasury offices or banks. In case of availing pension amounts from treasury offices, pensioners had to present themselves before the concerned treasury officers in person once every month while in case of banks it was once every year in the month of November. “This is one of the most benevolent and human initiative ever taken. I am aware of the difficulties faced by our pensioners in getting their due after serving a lifetime for the state. I appeal all to enrol themselves and get their digital life certificates so that their monthly pensions are deposited in their accounts on time without hassles,” Khandu appealed. He urged the departments of Audit & Pension, Information Technology & Communication and NIC to coordinate and create awareness about the initiative so that all state government pensioners avail this benefit. The Chief Minister suggested that to begin with all district administrations must be made aware of it and provide means to register pensioners of their respective districts. To mark the launch of the sensitization campaign, digital certification were done on the spot for two of the state government pensioners present. 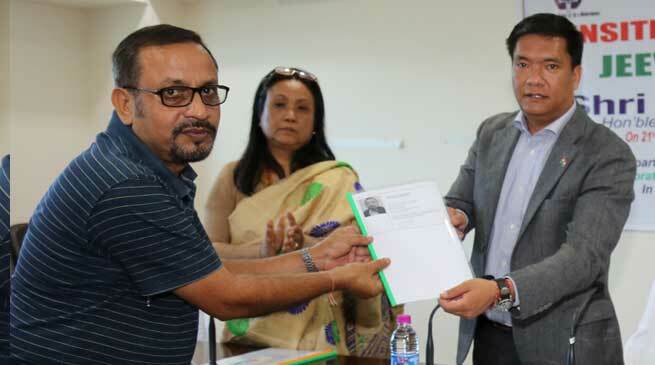 Rajat Bhattacharjee and K P Chakraborty, both retired state government employees, were authenticated online and given their digital life certificates. While handing over the digital life certificates, the Chief Minister appealed both and other pensioners present to spread the word among their former colleagues and pensioners so that more and more can avail the benefits of the initiative.